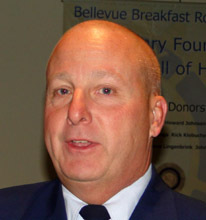 Rear Admiral Keith A. Taylor serves as the Commander of the Thirteenth Coast Guard District headquartered in Seattle, Washington. As District Commander, he is responsible for U.S. Coast Guard operations covering 4 states, more than 4,400 miles of coastline, 600 miles of inland waterways, and a 125 international border with Canada. Prior to this assignment, Rear Admiral Taylor served as the Assistant Commandant for Resources and Chief Financial Officer, where he was responsible for Coast Guard financial management and resource activities including planning, programming, budgeting and execution of the service's appropriations. He was promoted to flag rank in March 2008. Jim Gordon introduced both Rear Admiral Keith A. Taylor, Commander, 13th U.S. Coast Guard District, and his aide Lieutenant Jayna McCarron who is also a helicopter aviator. The 13th US Coast Guard District is headquartered in Seattle. This aviator admiral has an outstanding resume including advance education with an MS from Purdue University and an MBA from MIT. Along the way he also proved he developed excellent speaking skills. Admiral Taylor began by noting the United States is a maritime nation and visually showing the very large area covered by the 13th U.S. Coast Guard District, from southern Oregon to the Artic Sea with over 4,400 miles of coast line, 600 miles of inland navigable waterways, the biggest being the Columbia River, plus a lengthy Canadian coastal area where both countries maritime services cooperate very closely. He noted Puget Sound and the Columbia River have a high volume of ship, barge and other vessel traffic in all kinds of weather and that the combined Ports of Seattle and Tacoma make them the 3rd biggest in the nation. The theme of his talk was service, community and leadership. He described 3 goals: to develop teams that were proficient in their craft, proficient in leadership and disciplined in judgment. He applied those goals to a range of Coast Guard missions, ranging from a military mission of counteracting terrorism on the high-seas and in ports, law enforcement missions ranging from aids to navigation and vessel inspections (8,000 per year in 13th Dist) to make sea commerce safe, to frequently high risk search and rescue missions both at sea and in our mountains, usually in the worst of weather. Challenges also come from oil transiting from the AK north-slope to Anacortes by large tankers and derelict vessels anchored in inland water ways. From the large Exxon Valdez and Gulf oil rig environmental disasters to many that are smaller impact such as the recent events with the derelict Liberty ship Davy Crockett, the Coast Guard handles all aspects of ship safety, oil spill prevention, and oil spill clean up where they work closely with the EPA, WA Dept. of Ecology, and Canadian agencies. Admiral Taylor’s power point included great reviews of sea rescues and action pictures of helicoptersand motor life boats in action including over the Columbia River bar. Each looked like the the crews were on the wildest adventure rides imaginable. The training can be dangerous. As an example he told us that motor lifeboat crews are strapped in because they can and do occasionally go upside down in action. Most of the Coast guards ships from ice breakers, cutters, motor life boats etc are 40 to 50 years old and require extensive maintenance and repair. The Coast Guard, like all military services, emphasizes ceremony, structure and disciplined initiative, not only to instill pride and teamwork but also to reduce risk in a work environment that has a high number of risks. The Coast Guard is also aided by a large volunteer auxiliary that helps train thousands of boaters. BBRC members had many questions for the Admiral and gave him enthusiastic applause following his presentation. President Chris Monger, as is his tradition, opened with a music selection, a part of “Fire” and challenged the members to identify the recording artist and the music. Scott Hildebrand lead the invocation with a Thanksgiving prayer, followed by Jane Kuechle who introduced guests and visitors. President Chris announced BBRC TRF participation and the EREY program and ask all BBRC members to please participate, he also set out the meeting and off site schedule for the next two months. There are NO meetings Nov 23 and Dec 21 and the meeting of Jan 4,2 013 will be at the YMCA at Coal Creek and the meeting of Jan 11 is expected to be at the Bellevue College Planetarium. Dustin Walling, did a show and tell presentation explaining the BBRC New Member Committee 2012 project which updated a KITH family housing building in Kirkland with new efficient base board heating in each unit, plus stair and playground repairs and painting. The $7215 project was funded by BBRC plus a $3500 District 5030 grant. Dustin explained the project and grant process which in effect is a return of BBRC donations sent to The Rotary Foundation by each BBRC members annual contributions to the RI annual fund thru the EREY program. Bob Holert introduced, Mireli Contreras, from Sammamish High-school, as BBRC Student of the Month for November. She is another in a long line of outstanding Sammamish students with excellent grades and community service. She was described by one of her teachers as “one of the hardest working kids I have ever known. She takes many AP classes despite being an English as a second Language learner. She has a goal to be the first in her family to go to college. I cannot think of anyone I would rather promote as a perfect member of SHS community.” Mireli talked about her community service, her student advocacy, and plan to go to college at either the U of W, Western WA University or Evergreen College. Moireli’s parents were working and could not attend. She was accompanied by one of SHS’s 3 outstanding and helpful student counselors, Katherine Lamb. Madeline Gauthier and Laurie Mayer (DSHS) provided a visual and auditory overview of BBRC’s October 20th, 5th annual Family Fest Adoption Party. The mix of foster children generally were those that for a variety of reasons (such as 3 siblings “going” together, a autistic boy, a 16 year old boy etc) are the hardest to get adopted. For the children who attend it’s not only fun but gives them a sense of belonging (ie I am not the only one) and a greater sense of hope. Similar to years past 14+ of the 39 children at the adoption party have already been selected by families and are in the early process heading toward adoption. Laurie is awaiting data on an additional 8. We expect over the next year leading up to BBRC’s hosting the 6th annual Adoption Party in Oct 2013, to learn that “our” traditional 80 to 90% rate of “last years” children have been adopted has happened. Laurie noted the Adoption Party is not about percentages adopted – rather it’s about each child having a loving family to call his/her own forever. She gave an emotional Thank You to BBRC for helping make this possible over the years for so many foster children. This has been a wonderful ongoing BBRC- DSHS partnership that makes enduring and significant positive change in the lives of many foster children. held April 28, 2013. This is BBRC’s primary fund raiser. It raises the bulk of the money BBRC uses for the broad range of BBRC’s charitable service/work such as the New Member project, Adoption Party, College scholarships,Rotary First Harvest, Interact, Rotaract, Antigua Computer, Dictionary and Chess projects etc. Please contact Jim Carney for sponsorship opportunities and to help Jim identify potential New Sponsors!! Sponsorship $$ are a significant part of what $$ BBRC raises through the 10K. Please do your part and also put the April 28th date on your calendar. Ruben Ladland reminded us that BBRC needs 3 or 4 more members to sign up for 2 hour shifts as hot dog flippers for a Nov 24th (Sat) – (Crossroads Bartell Drugs Grand Re-opening event). This includes set up and runs from 11AM to 4PM. The club will receive a $400 donation. Please volunteer by contacting Ruben ( em:ruben.ladlad@bankwithsterling.com -Direct: (206) 342-6304 | Cell: (206) 399-4825 ) or BBRC administrator Kim Drieblatt ( em: kdreiblatt@gmail.com -425-444-7906 ) or to get more details. Paul Chapman announced he was passing the Thanksgiving baskets for $$ for BBRC annual Thanksgiving Turkey “Drop” to help struggling local families. His pass the basket technique raised an addition $646 with a few pledges still to come in. His annual “ask technique” seems to get better each year. there. We need 50+ BBRC members to be on stage to support our own DG Steve Lingenbrink and help pass the banner to the new incoming District Governor. Christine Rose reminded members to pick up tags from the BBRC’s annual Christmas Giving Tree and go shopping. These 120 BBRC Christmas gifts will be distributed by Hopelink, YMCA and KITH to families and children who otherwise would not receive anything for Christmas.